Professor Blackstock, an academic at the McGill School of Social Work, is internationally known for her First Nations social activism around the world. Over her 25-year career, Professor Blackstock has worked in child protection and for the rights of Indigenous children. 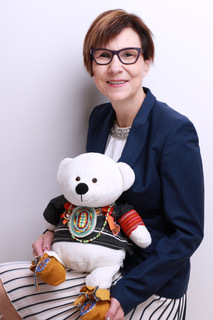 She has worked closely with Indigenous leaders to assist the United Nations Committee on the Rights of the Child in coming up with, and implementing, a General Comment on the Rights of Indigenous Children. CSU Vice-Chancellor Andrew Vann said hosting Professor Blackstock was an honour. “Professor Blackstock’s reputation in social activism is well known globally,” Professor Vann said. As part of Professor Blackstock’s visit, she will speak at a public lecture at CSU on Tuesday 28 August and participate in a community panel discussion on Wednesday 29 August. Professor Blackstock said she felt the opportunity to be a Visiting Scholar at CSU complemented her research interests in Indigenous theory and the identification and reversal of structural inequalities that affect Indigenous children, youth and families. “I am delighted to have the opportunity to act as Visiting Scholar at CSU,” Professor Blackstock said. Professor Blackstock’s approach of using culturally based and evidence informed solutions has been widely recognised by esteemed institutions such as the Nobel Women’s Initiative, Aboriginal Achievement Foundation and Frontline Defenders. CSU Faculty of Arts and Education Associate Professor Susan Mlcek said the public lecture was an exciting opportunity to hear Professor Blackstock speak at the University. “Professor Blackstock is an influential voice within the Aboriginal, social work and child rights communities around the world. “We can learn so much from her committed activism and care in creating positive change for marginalised individuals and communities,” Professor Mlcek said. Professor Mlcek said Professor Blackstock will speak at CSU in Bathurst over five days from 27 August and will be joined by Bathurst Wiradyuri and Community Elders and University academics. Professor Mlcek encouraged the community to attend the public events. “In her public lecture, Professor Blackstock will talk about the impact of ‘moral courage’ on cultural awareness and competency; decision-making; leadership challenges; and social engagement with communities and individuals,” Professor Mlcek said. The Wednesday panel discussion will include Professor Blackstock, Bathurst Wiradyuri and community Elders, and CSU academic Associate Professor Dominic Sullivan. “The public events are open to the community, academics and students who want to listen to and have a conversation about Indigenous rights, awareness, education, thought leadership and more,” Professor Mlcek said.